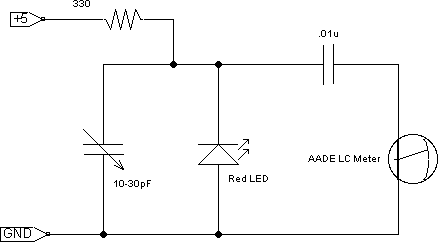 I wanted to see if I could find a good diode or LED + capacitor combination that might work for my QRSS project. So I placed some likely parts on the breadboard and attached my AADE LC meter. 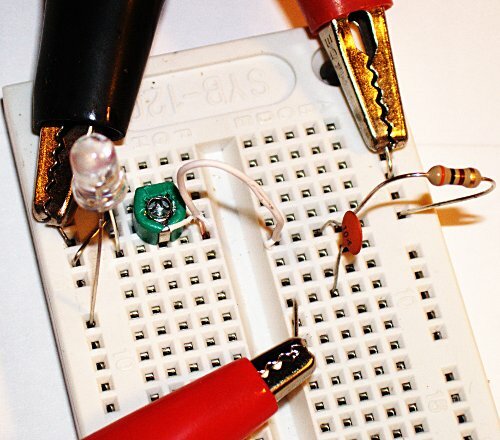 Since I plan to use a PIC 16F628A to pulse width modulate the LED I figured that I should keep the DC voltage on the breadboard between 0-->5vdc since the PIC will use a 5 volt regulated source. It turns out that I have about 200 red LEDs from an eBay purchase that work nicely in parallel with a 10-30pF variable capacitor. With some real quick testing it looks like I can dial this in between about 8-50pF pretty easily. I think that I need about 18pF for the current QRSS design that I am working with. This looks like it should allow me to vary the frequency of the transmitter fairly easily. The QRSS sub band is 100Hz wide. If you are doing any sort of FSK activity the general rule is to only run about 5Hz of shift since the sub band is so small. The last time that I tested this concept I think that 5Hz of shift at 10MHz is about .5pF. That is a tough value to try to achieve without something like varactor diode. A reverse biased LED can fill this role pretty nicely. The variable capacitor on the left should allow this to be rescaled for other bands fairly easily. The LED will allow for the 5Hz frequency shift. At some point in the near future I need to write a little test harness for the PIC and put on a breadboard. That would allow me to measure this as a complete circuit with the PWM running.